Not long after I started selling my own books on Atomic Avenue, I began to realize that I’m pretty much rubbish at any sort of repetitive process with a lot of steps…like, say, shipping out comic book orders. To help eliminate as many steps from the shipping process as possible, I came up with this macro which kick in whenever I get an order in my Outlook mail box. Now, whenever an Atomic Avenue order arrives, my default printer automatically prints out the packing slip and shipping information that was mailed to me. It also prints a shipping label on my Dymo Labelwriter for that order, marked with the order number and noting if it’s an Express Saver shipping order so that I know to stick on extra postage. Afterward, all I have to do is put the comics and packing slip in a box, slap on the label, and stick on the postage (or run it to the Post office). Download and unzip the AA_Label_Printing folder containing the various parts you'll need to your desktop (you can delete this folder when you’re done). Open that folder up. If you don’t see the Application Data folder, go Windows explorer and choose Tools -> Folder Options, click the View tab, then click “Show hidden files and folders” to show it. You can change this setting back to “Do not show hidden files and folders” when you’re done if you like. Important: When copying the VBAProject.otm file, do not replace any file by the same name that’s already there. 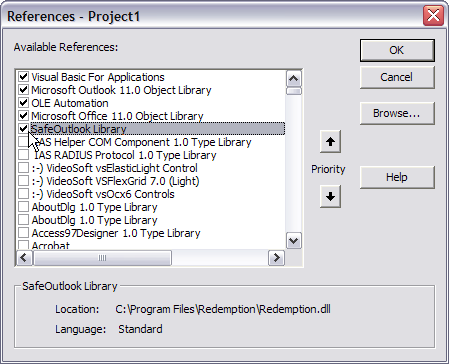 Launch your copy of Outlook and choose Tools -> Macros -> Visual Basic Editor. Choose Tools -> References, then check off the “SafeOutlook Library” reference from the (rather lengthy) list of available references. Launch your copy of Outlook and choose Tools -> Rules and Alerts, then click Options. Click Import Rules and choose the Print Atomic Avenue Label.rwz file from the AA_Label_Printing.